MBA students of Mahidol University International College (MUIC) participated in the “1st Global Business and Innovation Experience,” a four-day study trip to South Korea on July 24-27, 2018 aimed at expanding their academic, corporate, and cultural perspectives through a series of exclusive lectures and industry visits. 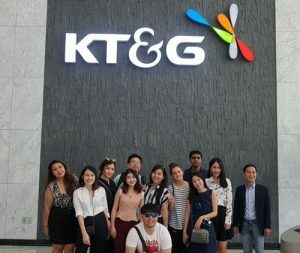 To broaden their view on how business is conducted in South Korea, the students also visited three well-known companies including KT&G Co., ETRI, and Samsung D’Light. Moreover, the students gained first-hand cultural experience by participating in a Korean tea ceremony while getting the opportunity to wear the “hanbeok,” the traditional Korean dress. The four-day seminar formally ended on July 27, 2018 with the certificate awarding ceremony. The study trip, which facilitates the acquisition of important practical experience and global perspectives to our MBA students, is now part of the MBA curriculum where students can choose it as an elective course.